The humble horseshoe crab is a reminder of prehistoric times. 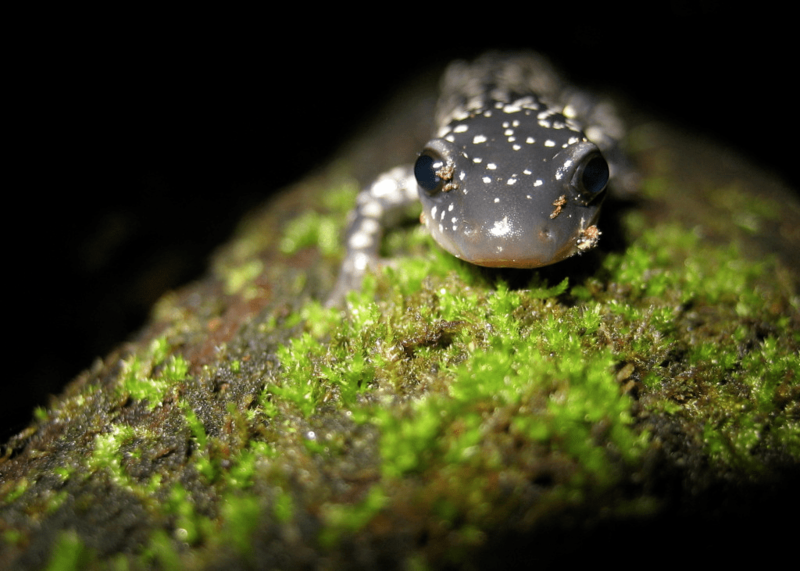 Public Radio International’s Living on Earth recently devoted a segment to this curious character. Steve Curwood: “For healthy oceans, it’s not enough to protect just the top of the food chain – the cod or halibut or swordfish we eat. The bottom of the food chain is vital too. That could be the plankton or the tiny forage fish eaten by many species – or it could be the extraordinary prehistoric-looking horseshoe crab. Karen Zusi: “There are a lot of reasons why someone might appreciate the lowly horseshoe crab. Eel and conch fishermen use them as bait, and medical companies draw blood from the animals. Horseshoe crab blood will clot in the presence of bacteria, so these companies can use the crab’s blood to make sure vaccines and medical implants are free of germs. Their blood is worth sixty thousand dollars a gallon. “But horseshoe crab populations are dropping. To preserve them, scientists and volunteers on Cape Cod are wading into the water to count and tag the animals. Zusi: “None of this would be possible without the Audubon Society’s volunteers. They come from all walks of life. 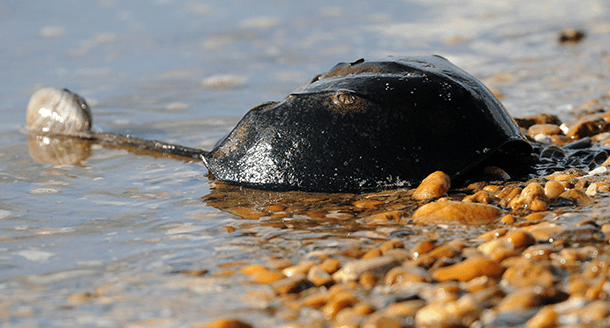 More here on the effort to study and protect horseshoe crabs. A horseshoe crab floats by the shore on Union Beach in New Jersey. The species is listed as Near Threatened by the International Union for the Conservation of Nature. Radio show Living on Earth did a segment in February on new technology to store and release solar heat. 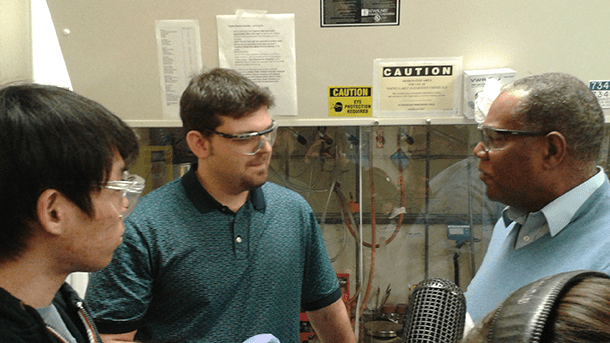 Here is host Steve Curwood on his outing to MIT to learn about the breakthrough. “A team of researchers at MIT has come up with a chemical that would let windshield glass directly store solar energy and then release it on demand as heat to melt the ice. … The same chemical could be woven into clothing fibers to capture the sun’s energy and then give you some added warmth when you ask for it, even days later. “CURWOOD: OK, so sunlight hits this molecule, it changes shape and can storage its energy. And how do you get the energy out? “The way we envision using it is to integrate into fibers that you then make clothing out of.” More here. Release solar heat from my coat in a blizzard? Where do I sign up? Living on Earth host Steve Curwood, right, in the MIT lab with Eugene Cho and David Zhitomirsky. As a coffee drinker and a fan of Dean’s Beans (whose mission is “to use high-quality specialty coffee as a vehicle for progressive change throughout the coffeelands of Asia, Africa and the Americas”), I was interested to come upon a Living on Earth radio story about the wider sustainable-coffee movement. Steve Curwood is host of the Public Radio International show. “CURWOOD: A cup of joe might help sustain your energy, but it may not be so sustainable for the Earth. 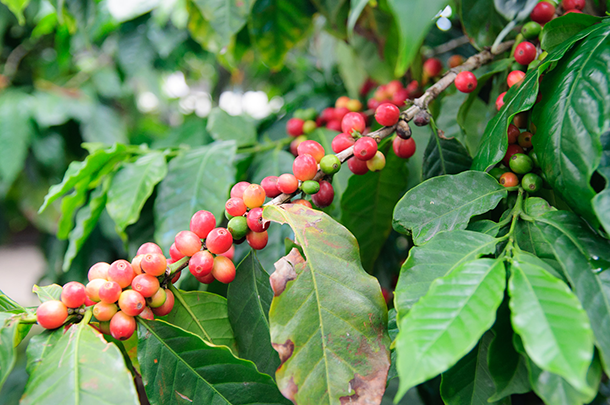 Just 12 percent of coffee is sold under the label ‘sustainably grown.’ A new initiative called the Sustainable Coffee Challenge aims to change the way the coffee industry operates to the benefit of the Earth. Peter Seligmann is chairman, CEO, and co-founder of Conservation International. 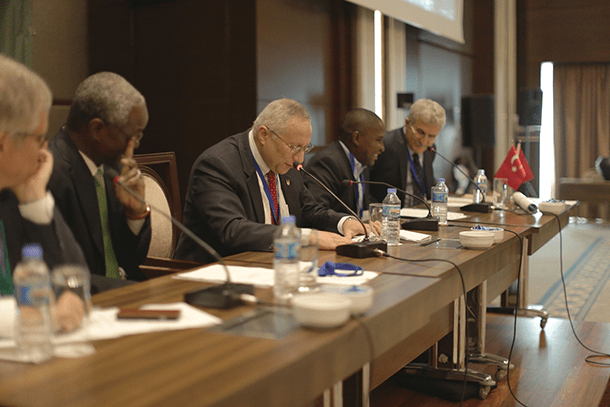 … So tell me about the sustainable coffee challenge that CI has just formed. Why did you zero in on coffee as a target for sustainability? “The dark side of coffee growing is that coffee that is not produced under the shade of forest, [is] produced by clear-cutting forests and planting coffee. And when you clear-cut a forest, you destroy the biodiversity, you put emissions — CO2 emissions — in the atmosphere, you lose soil, and you do industrial agriculture, which maximizes pesticides and chemicals and reduces the benefits to society. “CURWOOD: So, what’s the obstacle to growing coffee sustainably? “SELIGMANN: It’s convincing the producers that this is in their enlightened self-interest. To go from non-sustainable coffee to sustainable coffee requires an investment of money and it requires time. Most of these growers, farmers actually work in co-ops, and the challenge is getting the co-ops to agree that this is the transition they want to make from non-sustainable to sustainable and what’s going to motivate them is there being a buyer for the coffee they grow. And so it gets back to the consumer, and the consumer says it’s what we want.” Read on. Coffee beans are the pits inside the fruit or “cherry” of the coffee plant. The radio show Living on Earth recently reported how negotiations among environmental activists, the timber industry, indigenous people, and the British Columbia government protected 85 percent of a huge Canadian forest. 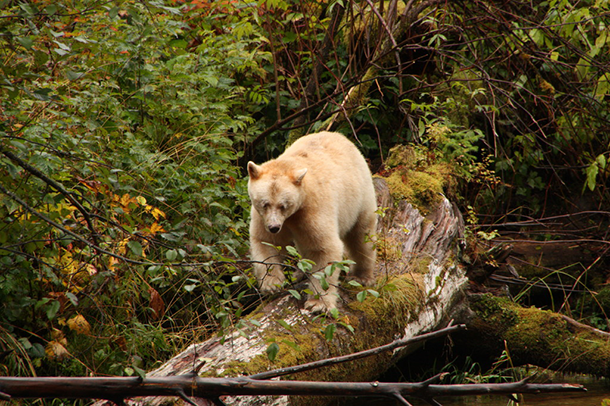 “Eighty-five percent of the Great Bear Rainforest in British Columbia is now protected … Steve Curwood discusses [the compromise] with reporter Andrew MacLeod of the magazine The Tyee, who explains what’s been protected and what’s open for logging. CURWOOD: “Tell me what is the [forest’s] Spirit bear? MCLEOD: “They are a subspecies of black bear. They are a genetic variant that comes out white, so it’s a white black bear. There are also Grizzly bears there, there are whales, wolves, and just a relatively pristine ecosystem up there. When Curwood asks why the timber industry agreed to the negotiation, MacLeod explains that the campaign to protect the forest helped to avoid extended confrontation. “Lots of First Nations people will tell you they’ve been on the land for thousands and thousands and thousands of years and it’s been sustainable, it’s been healthy, that it’s really only last 150 years of colonialism where you’ve seen clear-cuts and destruction and species driven to extinction. On the other hand, there are lots of people from First Nations who are working in the logging industry today as well. Over time, First Nations have sort of reestablished their rights. There have been some precedent-setting cases just in the last few years that have recognized aboriginal title does exist.” More here. Of possible interest: Read how Wabanaki diplomacy smoothed a similar negotiation process in Maine, here. Last month, Steve Curwood of the radio show Living on Earth covered a special conference on climate change. “Hmaidan: I was really happily surprised by how rigorous the Koran and the Islamic teachings on the environment and the care for the planet. It’s a core function of Islam to care for the planet. It’s a responsibility. … It talks about the delicate balance that all the creatures have on Earth and it’s the responsibility of humans to protect this balance. Mohamed Ashmawey, CEO of Islamic Relief Worldwide and one of the Climate Change Symposium organizers addresses attendees. “CURWOOD: Why did you decide to write a book about farming specifically for women? “CURWOOD: Audrey, what do women farm more typically as opposed to men? “LEVATINO: That’s a great question, and that’s another thing that I really investigated when I was writing the book. And many women get into this farming business. It starts off as just wanting to provide the best and healthiest, most local food that they can for their families. So women are growing a lot of different things, but in many cases it is healthy, delicious, seasonal food. They know exactly where it came from, so that their children and their husbands and their neighbors can have the best food possible. “But the other thing that I discovered as I got further into my research and interviewed lots of women farmers in my area and around the country is women are just amazingly creative: they grow herbs and other medicinal plants to make cheese, salves and tinctures. Women also tend to farm — when they do livestock — smaller animals. You know, things that are a little more manageable. And sometimes it’s for fiber — sheep and llamas and alpacas — other times it’s for milk, such as using goats to make cheese.” More here. Audrey’s farm, Ted’s Last Stand, is located near Charlottesville, Virginia. 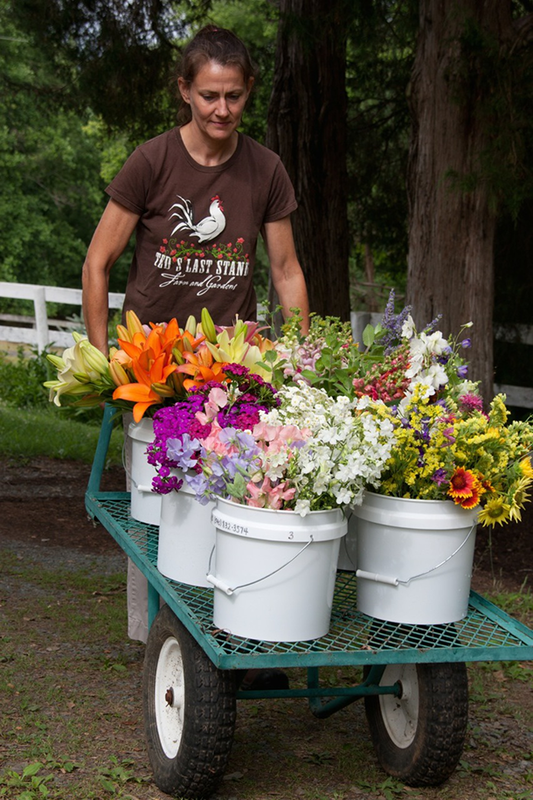 Audrey Levatino grows specialty cut flowers and sells them at local farmers’ markets to florists and restaurants, and for weddings.